One of today’s most exciting and compelling artists, Barnatan has recently been appointed New York Philharmonic’s first Artist in Association, which will see him perform multiple times with the orchestra over several seasons. “As well, we’ll revisit an ongoing theme, as we explore the relationship between Beethoven and his predecessors.” Barnatan will perform that master’s second piano concerto, then we get to the predecessor. Anne Manson has been systematically exploring several themes over the years, one of which is comparing and contrasting the work of Beethoven with that of his predecessors Mozart and Haydn. The conversation continues at this concert and gets even more interesting when we get to Mozart’s 40th symphony. Mozart’s K 550 is almost always heard with clarinets in the wind section, but this is not how WA scored it originally. Mozart was eventually coerced into adding the clarinets, but we’re going to perform as he intended. Think of it as a Mozart demo! The concert begins at 7:30 pm on February 18th in Westminster United Church, 745 Westminster at Maryland. Tickets are $30 for adults, $28 for seniors and $10 for students, including GST, at McNally Robinson, the West End Cultural Centre (586 Ellice at Sherbrook), Organic Planet (877 Westminster Ave) or MCO’s Ticketline (204.783.7377). Check out the ‘Extras’ tab below for Haley Rempel’s ‘Two-minute Talks, ‘The Trouble with Mozart’ and ‘The Death of Mozart’. Haley’s videos are available on most concert pages. Click ticket above to add to shopping cart; adjust quantity in cart and return to purchase other types of tickets. Born in Israel in 1979, Inon Barnatan moved to New York in 2006 and quickly made his mark on the American music scene. He won an Avery Fisher Career Grant three years after arriving, and has since performed with the nation’s foremost ensembles, including the Los Angeles Philharmonic and the symphony orchestras of Atlanta, Dallas, Cincinnati, Cleveland, Houston, Philadelphia and San Francisco. He has appeared at Carnegie Hall, Lincoln Center, the 92nd Street Y, San Francisco’s Herbst Theatre, Philadelphia’s Kimmel Center and Boston’s Jordan Hall. Internationally, Barnatan has performed with such leading orchestras as the Amsterdam Sinfonietta, Deutsches Symphonie-Orchester Berlin, National Arts Centre Orchestra, Netherlands Chamber Orchestra, Orchestre de la Suisse Romande, Shanghai Symphony, Jerusalem Symphony, London Soloists Chamber Orchestra, and the Orchestra of New Europe. He frequently makes appearances at Wigmore Hall and the Concertgebouw, besides performing at such venues as the Paris Louvre, Berlin’s Philharmonie, London’s Southbank Centre and Frankfurt’s Alte Oper. Highly sought after as a chamber musician, Barnatan was a member of the Chamber Music Society of Lincoln Center’s CMS Two program from 2006 to 2009 and continues to perform regularly on CMS programs both in New York and on tour. 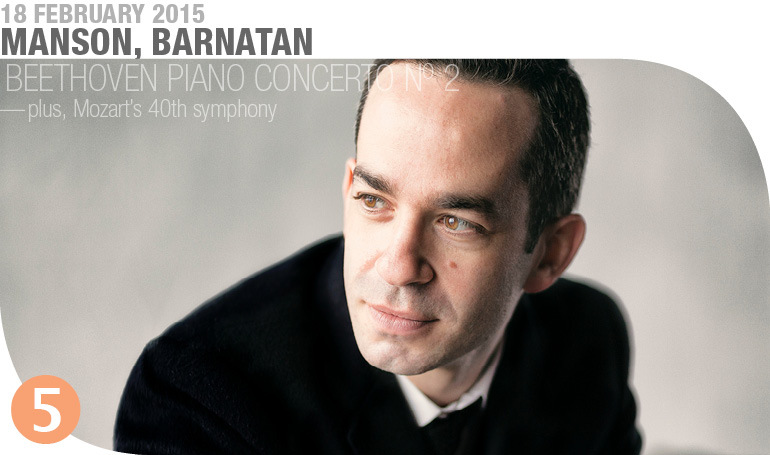 Barnatan has proven himself “a born Schubertian” (Gramophone). His most recent album, a celebration of Schubert’s late piano sonatas, was released by Avie in 2013 to a chorus of approval from BBC Music Magazine, Gramophone, and Sinfini Music, which admired the “dazzling range of pianistic colours and textures” he used “to trace the music’s underlying emotional narrative.” Reflecting his interest in musical storytelling, the pieces on Barnatan’s previous solo album, Darknesse Visible, were thematically linked, all being inspired by literary works. The disc was chosen ‘Instrumentalist CD of the Month’ by BBC Music Magazine and one of the top classical recordings of 2012 by the New York Times. Inon Barnatan was recently named the New York Philharmonic’s first Artist in Association, a major three-season appointment highlighted by multiple concerto and chamber collaborations with the orchestra. This season is also marked by debuts with orchestras including the Royal Stockholm Philharmonic, the Orchestre National de France, the Vancouver Symphony and the Orchestre Symphonique de Québec. In recital, Barnatan performs at Wigmore Hall and makes solo debuts at Chicago’s Harris Theater and on the Celebrity Series of Boston, to which he returns for the culmination of a US tour with his exclusive recital partner, cellist Alisa Weilerstein. Other upcoming chamber highlights include New York City dates with the Chamber Music Society of Lincoln Center, Jerusalem Quartet, Howland Chamber Music Circle, and members of the New York Philharmonic, with whom he performs Dvořák’s piano quintet. This follows a full summer in which Barnatan performed at the Hollywood Bowl with the Los Angeles Philharmonic and with the Academy of St Martin in the Fields, conducting Beethoven from the keyboard on a program featuring narration by Simon Callow. (A recent highlight for Barnatan was a 16-city tour of the US with the Academy). Also on the agenda were solo recital debuts at Warsaw’s International Chopin Festival and the Piano aux Jacobins festival in Toulouse, plus performances at many chamber music festivals. The creation of Mozart’s 60 or 70 symphonies (the commonly used numbering system is strongly out of date) spanned nearly his entire career. He composed the first five during his visit to England, age eight, in 1764, and the final three during the summer of 1788, when he was 32. Older composers such as Joseph Haydn, who became a close friend of his, helped to establish the symphony as an important musical form, and continued to contribute massively and ingeniously to its artistic growth. Mozart added nothing so revolutionary to its history. Still, his symphonies display an unfailing professionalism and contain much that is precious and beautiful. There are few really weak pieces in the canon, and many that are true gems. His greatest period of sheer symphonic productivity took place between 1770 and 1773, when he composed no fewer than 28 of them. This staggering output sprang from the practical demands of the time, and from his ever‑professional responses to them. After a gap of nearly two years since the creation of Symphony No. 38, he returned to composing symphonies in June 1788. In the space of three months he created his three final, and greatest, works in this form. He could not have known that they would be his last. It is fitting that he should conclude his career as a symphonist with three such masterpieces. They are quite different from each other: Symphony No. 39 is one of his most elegant creations, its successor (which he completed on 25 July) among his most pathetic. And appropriately, No. 41 is the grandest and most joyous of all his symphonies. Uncertainty also surrounds their performance during Mozart’s lifetime. It has long been assumed that none of them was played before his death. Circumstantial evidence points to one or more of them being performed on several occasions, such as a subscription concert at the Vienna Casino later in 1788, or during tours of Germany in 1788 and 1789. In 1791, the final year of his life, he prepared a revised version of Symphony No. 40, in which he added clarinets to the orchestra. This strongly suggests that he had heard the piece in performance and wished to make this significant alteration. For this evening’s performance, Anne Manson has chosen to perform the original version, without clarinets. In the opening movement, an overriding mood of resignation undercuts the music’s plentiful energy. The second theme resembles nothing so much as a series of sighs. The symphony’s sole oasis of repose arrives in the placid second movement. Even here, passages of troubled feelings crop up from time to time. The ensuing minuet lies as far from the ballroom as may be imagined. Its almost menacing outer panels make it perhaps the most disturbing example of its kind. The central trio section offers the barest glimpse of happier times. The forward drive of the first movement returns in the finale, with a more insistent edge added. Considerable momentum is generated, but the atmosphere of gloomy defiance persists to the very last bar, without winning through to any kind of emotional victory. Beethoven made the piano concerto every bit as much his own as he did the symphony. Building on the Classical traditions that he inherited from Haydn, Mozart, and other composers of the late eighteenth century, he expanded and enriched the concerto’s relatively limited form and emotional content by infusing his with hearty doses of boldness, heart and freedom. As with his symphonies, his makeover process on the concerto was gradual. First there were lessons for him to learn and dues he was required to pay. He arrived in Vienna at the end of 1792, intending merely to finish his musical education there, with Haydn, before returning to his home city of Bonn. Circumstances, his magnificent talents in particular, led him to change those plans. The Austrian capital was destined to remain the centre of his activities for the rest of his life. He won his first fame in Vienna as a pianist, appearing in the city’s fashionable salons and concert rooms. He gradually made a name for himself through his bold performing style, which included brilliant skill at improvisation. During this period, he composed solo piano works for his own performance. He revised certain of his existing creations as well, including the Piano Concerto in B-flat Major, his first work of this kind. Indeed, it is the earliest orchestral work he was prepared to acknowledge (a Concerto in E-flat Major ‘for harpsichord or piano,’ dates from approximately a decade earlier. It exists only in a version where the orchestral part has been arranged for piano). The earliest version of the B-flat may date back as far as 1788. He prepared a new edition in 1793, perhaps with the prospect of a performance, but the opportunity failed to materialize. Things came together two years later, at a charity concert in aid of the Society of Musicians. He played this work, but not before composing a new finale and revising the second movement. The great success he won that day placed him firmly in the spotlight. Beethoven held the Concerto ‘No. 2’ in rather low esteem, stating “I do not give it out as one of my best.” Yet this judgement may have sprung more from his recognition of its indebtedness to earlier models & Mozart and Haydn in particular & than any lack of quality. It displays, if not in fully formed states, many of the principal characteristics of the mature Beethoven: strength of purpose, imagination, lyricism, and a hearty sense of humour. It begins with an arresting call to attention, followed by a vigorous first theme and a relaxed second. The slow movement is rather formal but still expressive, with a particularly poetic concluding section. Beethoven’s pupil Carl Czerny likened it to a dramatic vocal scene. The finale is a bright, witty romp, with a cuckoo-like falling interval in the main, recurring rondo theme. The intervening episodes include a zesty minor-key excursion into Hungarian / Gypsy territory. Haydn had already exploited this popular flavour in his ‘Gypsy Rondo’ for piano trio, as had Mozart in his ‘Turkish’ Violin Concerto and Alla turca piano sonata. In the coming decades, Johannes Brahms would mine it even further in his Hungarian Dances, Piano Quartet No. 1, and other works. Praised for her warm tone and expressive playing, Canadian flutist Haley Rempel is gaining reputation for her sophisticated interpretations as well as her unique ability to capture audiences. Haley facilitates the MCO’s Pizza Club events.